Restaurants use broths for nearly every recipe that they offer the public. It's not possible to create a new broth each day, however. Custom Culinary products offer a solution with their proprietary bases. Use their products in your kitchen in order to create those spectacular dishes in a hurry. A soup base improves rice, noodles and dozens of other popular meals. Custom Culinary soup base comes in several different flavors. Choose between beef, vegetable, chicken, shrimp, bacon, au jus and clam bases. There are some specialized Custom Culinary broth cubes, too. If your customers are looking for a healthier base in their meals, try low-sodium beef and vegetable bouillon cubes. You'll still offer the customers an astonishing taste sensation but without the extra salt. Every base has a slightly different concentration so choose a handful of products to try. Your kitchen will be more efficient as a result. Custom Culinary Master's Touch Shrimp Base - 1 Lb. Custom Culinary Low Sodium Gold Label Vegetable Base No Msg Added - 1 Lb. Custom Culinary Masters Touch Beef Base No Msg Added - 5 Lb. Custom Culinary Masters Touch Au Jus Base - 1 Lb. 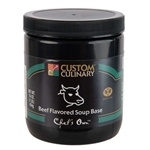 Custom Culinary Low Sodium Beef Base No Msg Added - 1 Lb. 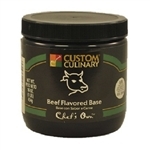 Custom Culinary Beef Base No Msg Added - 1 Lb. 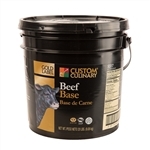 Custom Culinary Gold Label Beef Base No Msg Added - 20 Lb. Custom Culinary Gold Label Beef Base No Msg Added - 4 Lb. 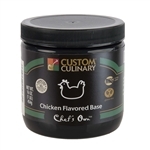 Custom Culinary Chicken Base No Msg Added - 1 Lb. Custom Culinary Low Sodium Chicken Base No Msg Added - 1 Lb. 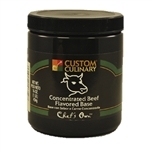 Custom Culinary Chefs Own Concentrate Beef Flavor Base - 1 Lb. 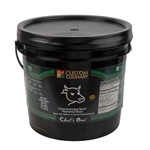 Custom Culinary Chefs Own Concentrate Beef Flavor Base - 25 Lb. 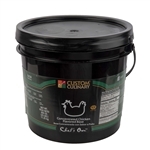 Custom Culinary Chefs Own Concentrate Chicken Flavor Base - 25 Lb. 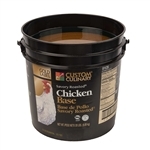 Custom Culinary Gold Label Chicken Base No Msg Added - 20 Lb. 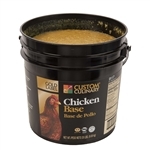 Custom Culinary Gold Label Chicken Base No Msg Added - 4 Lb. 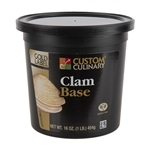 Custom Culinary Gold Label Clam Base No Msg Added - 4 Lb. Custom Culinary Gold Label Roasted Garlic Base No Msg Added - 1 Lb. Custom Culinary Gold Label Savory Vegetable Base No Msg Added - 4 Lb. Custom Culinary Gold Label Savory Vegetable Base No Msg Added - 1 Lb. Custom Culinary Gold Label Southwest Ancho and Lime Base No Msg Added 12 Oz. Custom Culinary Savory Rosted Beef Base No Msg Added - 20 Lb. 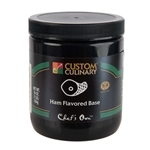 Custom Culinary Chefs Own Ham Flavor Base - 1 Lb. Custom Culinary Chefs Own Vegetable Base Light No Msg Added - 1 Lb. Custom Culinary Chefs Own Vegetable Base Light No Msg Added - 25 Lb. Custom Culinary Chefs Own Chicken Flavor Base Granules - 4 Lb. Custom Culinary Chefs Own Beef Flavor Base Granules - 1 Lb. Custom Culinary Chefs Own Beef Flavor Base Granules - 25 Lb. 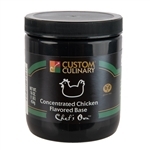 Custom Culinary Chefs Own Concentrate Chicken Flavor Base - 1 Lb. Custom Culinary Chefs Own Chicken Flavor Base Granules - 1 Lb. 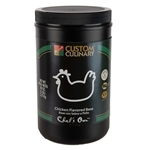 Custom Culinary Chefs Own Chicken Flavor Base Granules - 25 Lb. Custom Culinary Gold Label Crab Base No Msg Added - 1 Lb. Custom Culinary Gold Label Ham Base No Msg Added - 1 Lb. Custom Culinary Gold Label Lobster Base No Msg Added - 1 Lb. Custom Culinary Gold Label Mirepoix Base No Msg Added - 4 Lb. Custom Culinary Gold Label Mirepoix Base No Msg Added - 1 Lb. Custom Culinary Gold Label Mushroom Base No Msg Added - 1 Lb. 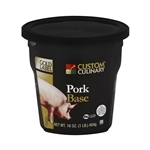 Custom Culinary Gold Label Pork Base No Msg Added - 1 Lb. Custom Culinary Gold Label Savory Roasted Chicken Base No Msg Added 20 Lb. Custom Culinary Gold Label Savory Roasted Chicken Base No Msg Added 4 Lb. Custom Culinary Gold Label Savory Roasted Chicken Base No Msg Added - 1 Lb. Custom Culinary Gold Label Savory Roasted Beef Base - 1 Lb. Custom Culinary Gold Label Shrimp Base No Msg Added - 1 Lb. Custom Culinary Gold Label Turkey Base No Msg Added - 1 Lb. 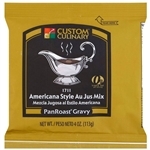 Custom Culinary Panroast Americana Au Jus Mix Gravy - 4 Oz. Custom Culinary Masters Touch Herb Rosted Au Jus Concentrate - 12 Oz. Custom Culinary Masters Touch Ham Base No Msg Added - 1 Lb. Custom Culinary Masters Touch Lobster Base Ranger - 1 Lb. Custom Culinary Masters Touch Beef Base No Msg Added - 20 Lb. Custom Culinary Masters Touch Chicken Base No Msg Added - 5 Lb. Custom Culinary Masters Touch Ham Old Smoky Base - 1 Lb. Custom Culinary Masters Touch Select Chicken Base No Msg Added - 5 Lb. Custom Culinary Masters Touch Standard Flavored Chicken Base - 5 Lb. Custom Culinary Masters Touch Standard Beef Flavor Base 1 Lb. Custom Culinary Masters Touch Beef Base No Msg Added - 1 Lb. Custom Culinary Masters Touch Chicken Flavor Base - 1 Lb. Custom Culinary Masters Touch Chicken Flavor Base - 35 Lb. Custom Culinary Masters Touch Low Sodium Chicken Base - 1 Lb. Custom Culinary Masters Touch Chicken Base No Msg Added 20 Lb. 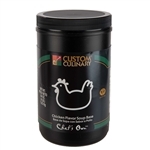 Custom Culinary Masters Touch Select Chicken Base No Msg Added 20 Lb. Custom Culinary Masters Touch Chicken Base No Msg Added 1 Lb. Custom Culinary Masters Touch Chicken Base No Msg Added - 35 Lb. Custom Culinary Masters Touch Chicken Base No Msg Added - 1 Lb. Custom Culinary Masters Touch Demi Glace Sauce Concentrate - 13.6 Oz. Custom Culinary Masters Touch Hollandaise Sauce Concentrate - 12 Oz. Custom Culinary Masters Touch Instant Cheddar Cheese Sauce Mix - 24 Oz. Custom Culinary Alfredo Gravy Mix - 38 Oz. Custom Culinary Sauce Mix White - 38 Oz. Custom Culinary Demi Glace Sauce Mix - 38 Oz. Custom Culinary Hollandaise Sauce Mix - 38 Oz. Custom Culinary Pork Barbecue Seasoning Red - 12 Oz. Custom Culinary Gold Label Clam Base No Msg Added - 1 Lb.